Ultra - Horizontal 4 Ft Double Deep Rack. 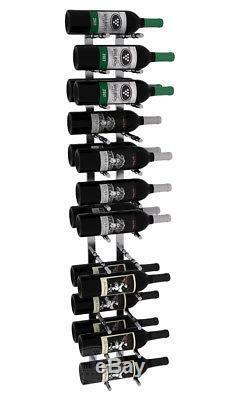 Display 24 of your best wine bottles with this 4 foot Ultra horizontal wine rack. Perfect for a beautiful wine display in the home or a commercial space. These racks are built from stainless steel and will last a lifetime. Show off 24 bottles (750ml). Mounts to almost any flat wall. (2) 4 foot horizontal rails. The Ultra Horizontal Series offers display appeal and maximum storage capacity. Made out of stainless steel, these rails are available in a satin black or chrome finish. Available in sizes ranging from 1ft to 4ft high and 1 to 3 bottles deep, these label out kits are perfect for any wine storage needs. Horizontal wall racks are perfect for any home or commercial business. Made from rugged stainless steel. Stores bottles with the label out. Holds standard 750ml wine bottles. Great for homes or businesses. Rubber rings holds bottle in place. Dealer Limitations: Customers are responsible for understanding the proper way to install this product. Racks that were ordered more than 90 days ago, have been used (installed), arrive damaged, or are not in good saleable condition, are not eligible for credit. Wine Master Cellars ("WMC") warrants to the original consumer-purchaser that this product shall be free from defects in workmanship and materials under normal and reasonable use for the lifetime of the product. Some states do not allow the exclusion or limitation of incidental or consequential damages. In such a case, the above limitations or exclusions may not be applicable. The item "24 Bottle 4 Foot ULTRA Horizontal Metal Wall Mounting Wine Rack. Chrome Finish" is in sale since Thursday, April 5, 2018. This item is in the category "Home & Garden\Kitchen, Dining & Bar\Bar Tools & Accessories\Wine Racks & Bottle Holders". The seller is "simplywineracks" and is located in North Salt Lake, Utah. This item can be shipped to United States, Canada, United Kingdom, Denmark, Romania, Slovakia, Bulgaria, Czech republic, Finland, Hungary, Latvia, Lithuania, Malta, Estonia, Australia, Greece, Portugal, Cyprus, Slovenia, Japan, China, Sweden, South Korea, Indonesia, Taiwan, South africa, Thailand, Belgium, France, Hong Kong, Ireland, Netherlands, Poland, Spain, Italy, Germany, Austria, Israel, Mexico, New Zealand, Philippines, Singapore, Switzerland, Norway, Saudi arabia, Ukraine, United arab emirates, Qatar, Kuwait, Bahrain, Croatia, Malaysia, Brazil, Chile, Colombia, Costa rica, Dominican republic, Panama, Trinidad and tobago, Guatemala, El salvador, Honduras, Jamaica.